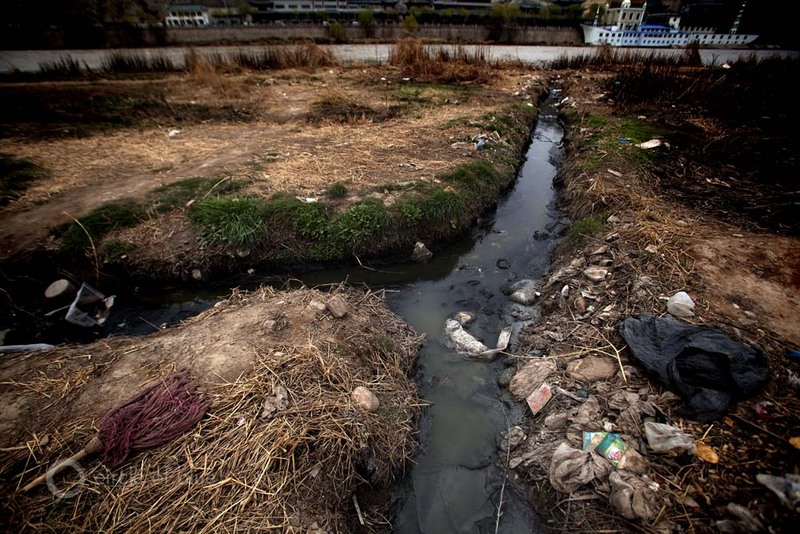 Polluted water and trash mingle on the bank of the Yellow River in Lanzhou, China. Click image to enlarge slideshow. JINAN, Shandong — The horizon gleams with a golden hue from the wheat fields that spread in all directions here in Shandong, a prime food-growing province on the lower reaches of the Yellow River. As hundreds of farmers spread the wheat like massive carpets to dry on country roads, combine machines are busy harvesting the grain. The same afternoon that the wheat harvest is finished, farmers will already be planting corn and other crops. This is how China feeds 1.4 billion citizens and millions of livestock. The seeds of the economic miracle that have lifted China to the world’s second-largest economy are in the farm fields and tumbledown villages that each year grow the nearly 600 million metric tons of food that sustain public trust in the country’s dramatic transition. Yet the ample harvest also comes with significant public health risks, as a farmer here explains. Damp with sweat, dust, and chaff, he pulls a plastic hose into a water pump that is powered by a truck with a belt-drive. The moment the engines roar, the ingenious makeshift machine fills the hose with turbid water from the nearby canal where a pharmaceutical factory has just dumped its rancid effluent. Shigong, a 50-year-old farmer from the village of Tizi, has spent his lifetime tilling the craggy desert hills that for centuries have been the only lifeline in dry Gansu Province. In this remote area of western China, the farmer’s life is guided by the whims of the seasons, the flow of the nearby Yellow River, and the fruits of the land. The rice paddies that feed Shigong’s home are giving an unmistakable sign of change. Salt and alkaline from a nearby chemical factory, as well as fertilizer overuse, have tainted the land and cut productivity. Rice is now the only crop that survives here in Tizi, and even that is struggling: one mu (roughly 0.07 hectares, 0.17 acres) produces about half a metric ton of rice annually, which is only half of what the land yielded less than a decade ago. Shigong’s plight is shared by other local farmers whose lands and lives are roiled by water shortages and pollution. In this arid corner of northwestern China – where rainfall measures in mere millimeters – small plots of maize and wheat squeeze between barren hills that are as dry as desert slopes. Rice paddies dot the banks of the Yellow River and its tributaries. Seen from above, the farms look like little oases surrounded by a barren wasteland. But the landscape is steadily changing. Since 2000, when China launched the “Go West” program to encourage industrial development and job growth in 11 of its western provinces and autonomous regions, Gansu’s industries and income levels have been rising. The development has turned Gansu and its neighboring provinces from primarily agricultural societies to ones that are putting more attention on developing heavy industry. In an attempt to expand coal production westward, for example, China plans to open 15 large coal bases by 2015, mostly in Inner Mongolia, Ningxia, Shaanxi, and Shanxi. Despite better regulation, experts worry that, as China’s development moves west, it will transfer its pollution as well. When the water turned black last month, he adds, most of the crop died after being irrigated with it — and what did not wither was sent to the market. The farmer’s plight underlies a dirty truth about China’s fast development: the nation’s rivers, lakes, and falling water tables are enduring deficits of clean water that often force farmers to grow food using water that is tainted with heavy metals, organic pollutants, and nitrogen. Much of China’s water is so contaminated that it should not even be touched, yet tremendous amounts of the grains, vegetables, and fruits that are served in homes and restaurants, as well as textiles that are sold in markets, are irrigated with untreated industrial wastewater. Crash programs to build highways, railways, airports, modern manufacturing bases, and other equipment have distinguished China for a generation. The country has not, however, launched any similarly comprehensive or sustained programs to clean up its filthy water, though reforms may be on the horizon. Water and soil pollution in China are so prevalent that the nation’s farm productivity, its economy, and the people’s health are at risk as modernization, urbanization, and food demand are steadily increasing. Furthermore, China’s Ministry of Land and Resources estimates that heavy metal pollution destroys 10 million metric tons of grain and contaminates another 12 million metric tons annually, incurring billions of dollars in direct economic losses each year as China struggles to satisfy the evermore-sophisticated diets of its growing population. With more and more Chinese moving into the middle and upper classes each year, so increases their ability to afford meat products like beef and pork, which are extremely water intensive as they must be fed substantial amounts of grains. Meanwhile, as much as 10 percent of China’s rice, the country’s staple food, may be tainted by poisonous cadmium, a heavy metal that is discharged in mining and industrial sewage, according to scientists at Nanjing Agricultural University. Food safety is a deep concern among Chinese citizens, a matter of national significance as old as the country itself. After years of high-profile scares — deadly melamine milk, recycled “gutter oil,” fake beef, and exploding watermelons, among others — food safety scandals are producing public ridicule and ire in a political system that has vowed to serve the people. As the public has called for the country to dramatically strengthen its environmental safeguards, authorities have begun setting nationally significant standards for water, soil, and food to curb the grimy side effects of sizzling economic growth. Agriculture is a vital industry in China, employing more than 300 million farmers and feeding a rapidly growing nation, still haunted by memories of severe famine and poverty during the 1950s and ’60s. And as China ranks among the global firsts in output of rice, wheat, potatoes, tea, cotton, meat, and other crops, the security of its food supplies could have significant global implications as well. While years of food scandals have focused public attention on factories and markets, few have looked at the source of the food chain — soil and water. For instance, one-fifth of the Yellow River, northern China’s lifeline, should not be used for drinking, energy production, or irrigation; about 40 percent of the Hai River, which supports major food-producing areas in the northeast, is considered unusable. In fact, nearly 15 percent of China’s major rivers are not fit for any use, and more than half of the groundwater nationwide is categorized as “polluted” or “extremely polluted,” according to government statistics. 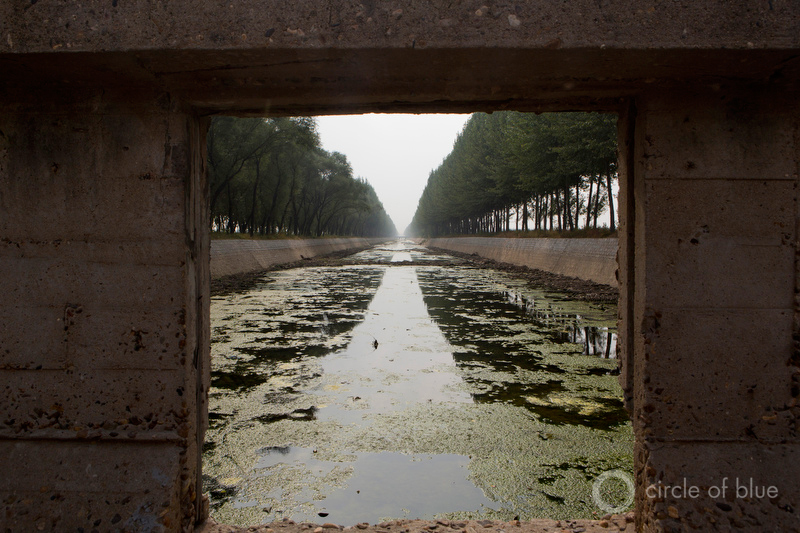 The Yellow River flows around a water-intake pipe to a purification building that has fallen into disrepair, forcing the residents of Liang Jia Wang, one of China’s many “cancer villages,” to drink water straight from the dirty river. Nearly 15 percent of China’s major rivers are not fit for any use, and more than half of the groundwater is labeled “polluted” or “extremely polluted.” Click image to enlarge slideshow. Moreover, China’s pollution hotspots are occurring in the places where economic growth is the highest and water resources are under the most stress — China’s dry northern breadbaskets and its biggest manufacturing hubs in the south and east. Nearly 10 million of China’s 120 million hectares (25 million of 295 million acres) of cultivated land have been polluted, and more than 133,000 hectares (330,000 acres) have been infiltrated or destroyed by solid wastes, according to official statistics. Furthermore, half the soil in southern manufacturing cities is reportedly contaminated with cadmium, arsenic, mercury, petroleum, and organic matter. 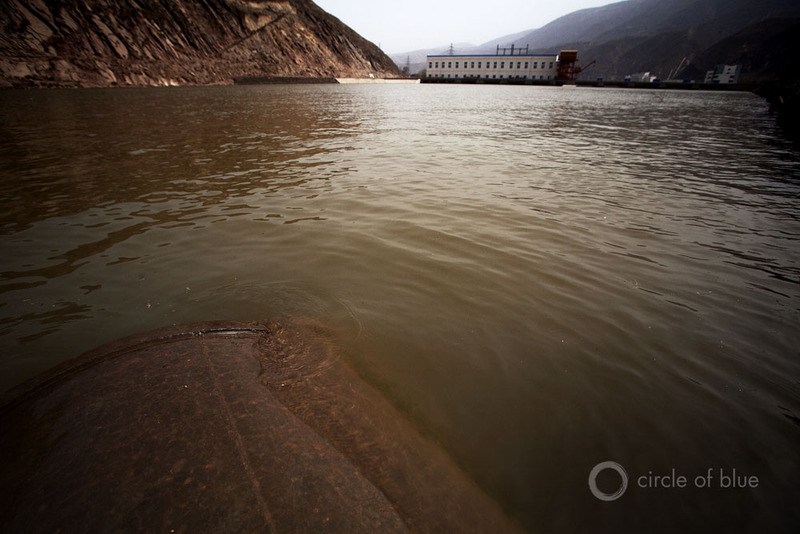 Spills and other pollution incidents from industrial and sewage treatment plants in recent years have drawn attention to some of China’s dirtiest rivers and lakes. Protests calling for dramatically strengthened environmental safeguards in China are now occurring with more frequency, signaling an awakening of both the public and government’s conscience about the environment. But few realize that more than half of China’s water pollution comes from agriculture itself: fertilizers, pesticides, and livestock waste that are carried into lakes, rivers, wetlands, coastal waters, and underground aquifers by rainfall and snowmelt. High nutrient levels from fertilizer runoff produce mats of thick algae in a main-stem irrigation canal in Liaoning Province. Click image to enlarge slideshow. This runoff is called agricultural non-point source pollution, because it cannot be traced back to one source, like pollution from a factory can be. Agricultural non-point source pollution is the dominant source of water pollution in China, and it also serves to increase soil erosion and reduce the productivity of the land. This kind of pollution has proved difficult to control globally, and most technical measures in China are focused on prevention rather than treatment. While young people around the world are saving up to buy the latest laptops and tablets, recent college graduates Tang He and Dai Xiaoyan are taking on heavy metal pollution in their native Hunan Province. Zinc and indium factories – for new display technologies and other uses – are among the biggest sources of pollution in the Xiang River and have tainted miles of farmland throughout the province. But Tang He and Dai Xiaoyan, who make up almost the entire staff of the toddling environmental NGO Green Hunan, are pushing the boundaries of open information about water pollution in Hunan’s government. In a country notorious for its weak local enforcement of pollution control regulations, Green Hunan innovates at the grassroots level by using water samples, fresh data, and existing laws to pressure local governments into releasing water pollution information. They have also built a volunteer network of active citizens, scientists, universities, policymakers, and environmental lawyers to monitor and publicize information about pollution in the Xiang River and its tributaries. Activism about the environment is growing in China, as its fledgling green movement is taking root in some of the most remote regions of the country. For example, Green Hunan – advised by Liu Shuai, a progressive official at the Hunan People’s Congress Committee who promotes public and media monitoring of local governments – is currently collaborating with scores of other environmental organizations throughout China on a tool to rank Chinese municipal governments and some companies based on how compliant they are in releasing environmental information. In China, where guanxi – the art of connections and relationships – makes everything easier, environmental NGOs are also learning to build trust with local authorities. “We avoid being an opponent of the government. Instead, we make an objective assessment and recommendations on their performance, based on real data that we collect,” Tang He said. Among China’s influential environmentalists is Ma Jun, a 44-year-old former journalist. Now Ma is the head of the Institute of Public and Environment Affairs, which compiled China’s first open-source online database of water and air pollution records and in 2012 prompted multinational giants like Apple to confront the pollution problems created by their Chinese suppliers. The cruel irony is that China has become the largest producer and consumer of fertilizers and pesticides in the world, according to China’s Journal of Arid Land. Likewise, giant pig and poultry farms have also developed rapidly to satisfy the nation’s growing demand for meat: in 2002, the total livestock waste was more than four times greater than the production of industrial organic pollutants. In fact, animals produce about 90 percent of the organic pollutants and about half of the nitrogen in China’s water, according to Wang Dong, a senior expert at the Chinese Academy for Environmental Planning. Just how much damage China’s soil and water pollution has brought to people’s health, the land’s productivity, and the state’s economy is not completely clear, say authorities both inside and outside the country. China’s attempt to introduce a “green GDP” in 2004 put the cost of the environment at about 3 percent of economic growth. According to the World Bank, the costs of environmental degradation and resource depletion in China approached 10 percent of GDP over the past decade — of which water pollution accounted for 2.1 percent and soil degradation for 1.1 percent — though this estimate only measured the impact on human health. Central government authorities have acknowledged industry, agriculture, and cities as sources of pollution and have given a much bigger role to environmental regulations in China’s development plan through 2015. Recent reforms have introduced stricter targets for reducing major pollutants, and with promising results. The central and provincial governments have invested more in cleaning up rivers and lakes and in reusing recycled water in homes, industries, and even on farm fields. They are also using award payments to persuade local authorities and businesses to take action on environmental programs and other initiatives, such as subsidizing biogas equipment in pig farms and spreading the residual on fields as a more natural alternative to synthetic fertilizers. Eastern Chinese cities are also clamping down on where businesses can build pig farms, manufacturing factories, and power plants, in hopes of keeping nearby water bodies clean. Meanwhile, foreign companies are rushing to cash in on cleaning up China’s pollution, as the Chinese government plans to invest $US 63 billion in the water-treatment sector during the current 12th Five-Year Plan period (2011-2015). Though investment in urban wastewater treatment is becoming more common, there is also increasing interest from the private sector in investing in solutions to rural pollution. As a sign of new attitudes to food, fledgling companies offer to provide an organic certification, printing up organic or “green” food labels — for a fee. Even though agriculture officials promote organic, “green” food, and “no-harm” programs to reduce the use of harmful chemicals in food, there are still many reports of cheating and violations. Because citizens are calling more attention to the links between pollution and deteriorating public health, independent authorities note that the increased activity is elevating the environment — and water issues in particular — to a much higher political priority in China. 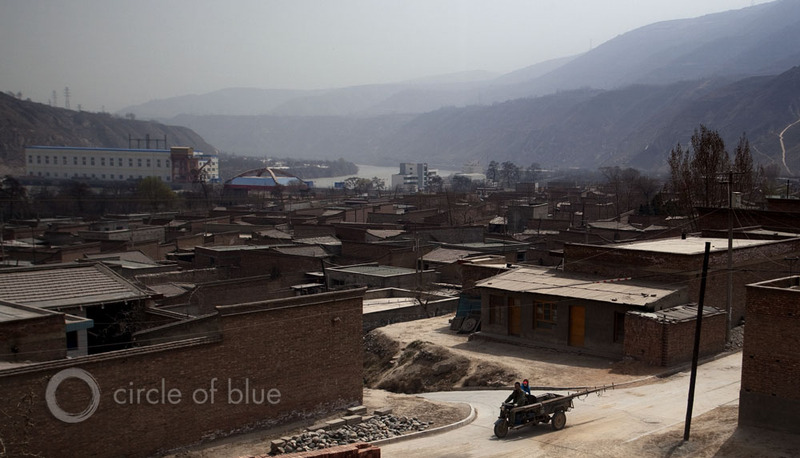 With no access to water aside from that of the contaminated Yellow River, residents of Liang Jia Wang, one of China’s many “cancer villages,” have noted the alarmingly high cancer rates in the area. The local government posts weekly updates about the hospitalized residents in the village, where the average life expectancy is around 40 to 45 years. Click image to enlarge slideshow. But controlling agricultural pollution will prove difficult, given that China has such an eclectic mix of farmscapes — from rural households to collective units to those that are state-owned, —since the country’s economic opening in 1978 when many farmers divided up their farmland. Not to mention that, in a country notorious for its weak local enforcement of environmental regulations, central efforts are often at odds with the economic interests of local businesses, governments, and farms. China’s overwhelming local protectionism of polluting industries unveils a tight alliance between officials and local industries, often triggered by the pressure on local authorities to show progress in developing the economy. In the years of state-run market economics, local governments prioritize industrial growth, often at the expense of environmental regulation. As environmental problems persist, social frustration builds up over the lack of effective alternative channels for complaint, the weak local enforcement of environmental laws, and the lack of accountability by the private sector. Many local protests against pollution incidents have thus focused on the strong state-corporate ties that hamper real reforms on the ground. Photos by Adam Dean, as well as Circle of Blue reporters Aaron Jaffe and and Keith Schneider. Trash and other debris, including empty plastic pesticide containers, foul an irrigation canal near Xian in Shanxi Province. Click image to enlarge slideshow. I won’t put anything in my mouth that comes from China! I try not to buy anything made there either. I don’t support polluters or dictators. Wouldn’t knowingly eat or drink anything from Chinese ingredients. Unfortunately our labelling laws are so polluted with corruption, they compare with the pollution of Chinese agricultural. Look at an ingredients label, if it says ground ginger or garlic, it is most likely from China! My little English village shop sells garlic from China! What the fracking hell is going on. Cheap cr@p food that importers love. The non-point source pollution from agriculture is a horrible cycle that even the US has problems with, though China’s probably contains magnitudes more pesticide and fertilizer residue at this point. Here’s hoping that China will start putting money into research and installation of best management practices for stormwater and ag soon.